A BUMPER weekend of NAB League girls football will have onlookers having to choose which games to keep an eye on, with fixtures spread across the state in the 12:45pm timeslot on both Saturday and Sunday. In arguably the game of the round, Bendigo hosts Dandenong for an outcome crucial to their finals aspirations, while some sides will suffer from forced changes on the back of AFL Academy games. A late fixture change sees Northern Knights travel to Garfield to meet Gippsland Power and open Round 6. After a minor hiccup in the form of a draw against Oakleigh in Round 2, the Knights have hit form once again and rolled on to three-consecutive wins. The travelling side’s depth will be tested though as four of their star players come out of the side due to Academy commitments, but the likes of Jess Fitzgerald and Abigail Bennett should thrive of an extended run in the midfield and deliver well to perennial forward target Nell Morris-Dalton. It has been a much different season for Gippsland, still searching for its first win in season 2019 and coming off a 62-point thumping at the hands of Bendigo. Still, developing talents in the form of Nikia Webber and Chandra Abrahams amongst others continue to show promise in a tough year and should have a good opportunity to shine this week. Both the Oakleigh Chargers and Murray Bushrangers will be hoping to bounce back from Round 5 losses when they do battle on the metro side’s home turf. After toppling a dangerous Calder side, Oakleigh were upset last week as Sandringham notched its first win for the year, while Murray has suffered consecutive defeats after a big wins over Western and Gippsland in Rounds 2 and 3. With wins on the board for both sides, this will be a tough ask for Oakleigh as it looks to charge back into a top four spot – and can do so if other results go its way. Murray hang on the other side of that chasing pack, and will look to the likes of Millie Brown and Abby Favell to regain their form, while Sophia McCarthy is set to back up her three-goal Round 5 haul. For Oakleigh, Mimi Hill was electric last week, and will be a key player again with Gemma Lagioia one who can build on her Round 5 performance and Alana Porter another in good form. While it will prove a test for the home side, the Charger will be confident of bouncing back onto the winners list here. Bendigo Pioneers faces an uphill battle in its push for a finals berth, faced with a Dandenong Stingrays side also poised on 12 premiership points. The Stingrays went down narrowly to the dominant Geelong Falcons last time out, but certainly showed their credentials as a genuine premiership contender with an eye-catching first half. The Pioneers are also staking their claim with three wins from their last four outings, headlined by a standout 62-point drubbing of Gippsland last week. With the sides poised evenly and the race for finals spots heating up, this is shaping to be the game of the round. Brooke Vernon and Zoe Hill have been consistent features for Dandenong thus far, and will have to stand up with Academy prospects Isabella Shannon, Molly McDonald and Tyanna Smith all out this week. The Pioneers managed to keep a relatively steady lineup, with Elizabeth Snell coming off a five-goal haul and Brooke Hards their key ball winner, while Kate Douglass has been immense down back. It will be a good opportunity for Bendigo to prove themselves further, with the home ground advantage in tow. Another exciting match-up with finals ramifications is set to take place on Sunday, with Eastern Ranges playing host to Calder Cannons in Bayswater. Both sides experienced losses over the last couple of weeks, with Calder falling to Oakleigh in Round 4 and Eastern going down to Northern last week. With Calder currently holding the edge over their weekend opponents on four wins as opposed to three, this will prove to be a classic ‘eight-pointer’ in the race for a top four spot. Tarni Brown remains in a weakened Ranges side on the back of Academy selections, with Tess Flintoff another who has recently benefitted from the ruckwork of Serena Gibbs. While Calder faces a similar situation with the loss of Georgia Patrikios, Georgie Prespakis remains alongside Alana Barba in a tight-knit midfield. With plenty on the line, expect these sides to throw everything but the kitchen sink at getting a result here, with either team capable of kicking big scores. A second win is up for grabs for both Greater Western Victoria and Sandringham Dragons as they do battle in Ballarat on Sunday. The Rebels have not quite been able to recapture the form that earned them a Round 1 win over Bendigo, since falling in every game coming into this clash on the back of an upset loss to Western. Conversely, the Dragons look to finally be playing themselves into some form after knocking off Oakleigh last week for their first win of the season. Rebels midfield ace Ella Wood will be important in the engine room alongside Chloe Leonard, with Sophie Molan out of the side, while Sandringham will look to Winnie Laing to shoulder most of the midfield load as Alice Burke goes out. With the form of either side differing at this point of the season despite their identical record, the Dragons will be confident of making it two-straight in a tight tussle. In the round’s last listed fixture, Western Jets faces a tall order in building on last week’s winning effort, as a meeting with the undefeated reigning premiers awaits. The Falcons found themselves behind for the first time in a long time last week against the Stingrays, but rallied in the second half to keep their perfect record in tact. Western will be hoping for more of the same in that respect, as the Jets looked the best they have all year in Round 5 as it overcame GWV for win number one. They will have to do so without the prolific Isabella Grant, leaving a heap of heavy lifting for fellow midfielder Elisabeth Georgostathis. In a testament to their depth, the Falcons will only be without skipper Lucy McEvoy due to Academy duties, with the likes of Luka Lesosky-Hay, Paige Sheppard, and Darcy Moloney able to fill the void in midfield. With the Falcons’ forward line clicking into gear, their defence sturdy as ever, and everything in between up to scratch, it is always hard to look past the undefeated unit in any game. THE halfway point of the inaugural NAB League Girls is up this weekend, with Round 5 shaping up to have a host of interesting matchups. The Calder Cannons will be looking to maintain their high position on the ladder with another win this week, while two other matches will include the other four sides in the top five of the competition. The Calder Cannons will have the home advantage when they take on the Murray Bushrangers to open Round 5, and will come in needing a burst of confidence after a 10 point loss to the Oakleigh Chargers last week disrupted their fantastic start to the season. The third placed Cannons will take on Murray in eighth, sitting on two and two, with a disappointing loss to the Bendigo Pioneers last round likely to spark them into action this week. This week’s Murray lineup has seen a lot of changes, but Round 4 best on, Millie Brown was not one of them after a phenomenal performance last week saw her pick up 27 touches, six rebound 50s and two marks. Abby Favell also put on a great effort last round with 22 disposals, five marks and eight tackles, so will want to replicate her fine season form again this week to propel Murray to a better result than last week. 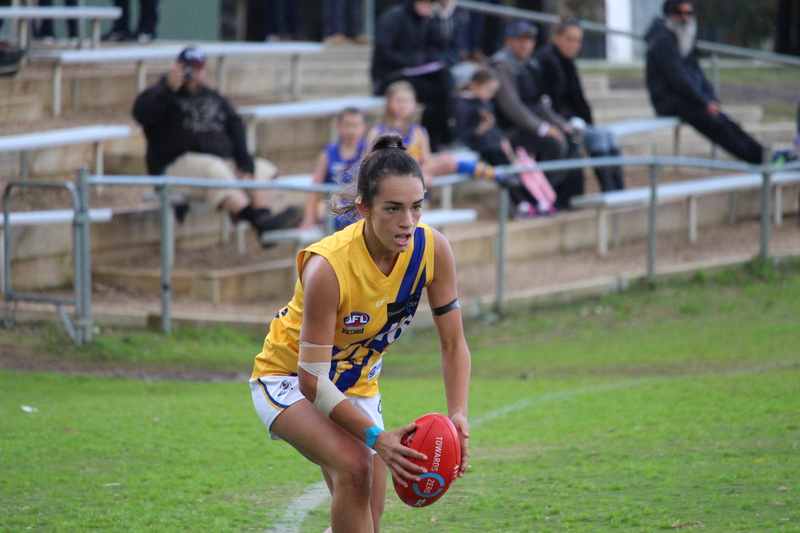 Calder bottom-ager, Georgie Prespakis is back in the side this week after missing Round 4, so the Cannons will be hoping for another influential performance from her with Krstel Petrevski missing from this week’s lineup. To beat the Cannons the Bushrangers will have to boost their opportunities in front of goal, or otherwise suffer a fate similar to last week. The second match of Round 5 will be one to watch, with fourth placed Dandenong Stingrays hosting table toppers, Geelong Falcons. Both sides registered big wins in Round 4, so will be looking for another opportunity to get a win on the board. However, both sides seemed to have an issue with accuracy, with Geelong kicking poorly in front of goal, finishing with 17 behinds in their win against Greater Western Victoria (GWV) Rebels. If the Stingrays can put on the pressure in their defence they may have an opportunity to stop the Falcons’ strong forward line in its tracks and come out on top. That being said, the Stingrays posted 12 behinds against the Gippsland Power in Round 4, so will want to make sure their kicking is on when they take on the reigning premiers. With at least 6 confirmed changes to the Stingrays’ lineup since last round, it will be interesting to see how the side takes the field against the Falcons at full strength. Luka Lesosky-Hay will be looking to replicate her strong Round 4 effort (31 disposals, eight marks) this week after being a standout performer across the board last round, but in front of goal will need to double down after three behinds contributed to Geelong’s frustrating winning margin last week. Maeve Skinner is another one who will want to boost her accuracy this round, with two goals from six kicks last week after a dominant four goal haul in Round 3. The Stingrays had five individual goalkickers against the Power, with Georgia Howes booting two, so the side will need to keep up their team effort in front of the big sticks if they want to get on top of Geelong this round. The Oakleigh Chargers are sitting in sixth at this point of the competition, and with such a short season every point matters, so will want to win this one against the Sandringham Dragons in tenth. 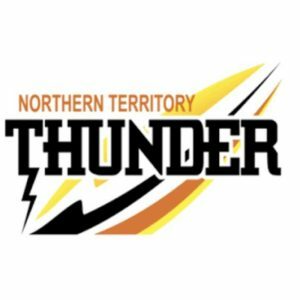 The Chargers have only dropped one game and drawn with Northern this year, so are shaping up to be real contenders if they keep up this good form, while the Dragons have yet to win a game. For Oakleigh, Amelia Van Oosterwijck is out of the side this week, so it will be interesting to see how they perform without one of their main targets forward. Gemma Lagioia was strong last week, with 21 touches and a goal, so will look to continue her form to get another win for her side. Meanwhile for Sandringham, Bryanna Arnold put on a good performance last week with 17 disposals and six tackles, so will want to put the pressure onto Oakleigh to aim for their first win of the season. The Dragons only managed to get two majors on the board last round, both through Sophia Rothfield, so will want to double down on that effort this week to create a strong team effort against the Chargers. Sunday’s first match will see seventh placed Bendigo Pioneers host eleventh placed Gippsland Power, with Bendigo needing a win if they want to stay in touch with the leading sides in the competition. The Pioneers had a good win against the Bushrangers last week, kicking two final quarter goals to cement their second win for the season. Tackling pressure seemed to be a major focus in that match with seven players registering five or more, while Brooke Hards alone racked up a massive 11 tackles to go with her 17 touches. The Pioneers will have to bump up their attacking pressure and volume in front of goal to combat the Power down back, with Megan Fitzsimon racking up 26 touches, five marks, four tackles and five rebounds last round while Nikia Webber was out. Webber will be back this round, so it’s likely we will see Hards and Webber line up alongside each other in this matchup. Missing from the Power this week is ball magnet, Grace McRae, while her Pioneers counterpart, Elizabeth Snell is a big inclusion for the home side. Cellar dwellers, Western Jets will host ninth place GWV Rebels in the penultimate match for Round 5. Both sides will be looking toward a win this week after a winless Round 4, but the Jets will want to take advantage of their opponent also sitting low on the ladder.The Rebels had a disappointing match when rendered goalless against ladder leaders, Geelong last week, though Nekaela Butler was impressive despite the loss, with 21 touches, four marks and six rebounds. Lauren Sykes put up her best performance for the season so far, with 16 disposals (15 kicks), seven rebound 50s and three tackles. The pair will be bolstered this week with the return of Ella Woods and Nyakoat Doijok, though dominant ruck, Maggie Caris has not been listed for Round 5. Isabella Grant (17 disposals, seven tackles) and Elisabeth Georgostathis (13 disposals, two rebounds) were best on for the Jets last round, however the loss of Cleo Saxon-Jones will surely be an issue through the midfield. All in all, it should be an interesting match with both sides chomping at the bit for a win. In the final match of Round 5, second and fifth on the ladder will face off in another game that could be one to watch. Both Northern Knights and Eastern Ranges come into this round off the back of two wins in a row, so it’s likely to be a close one if Eastern put in the hard yards against last year’s grand finalists. The Ranges will want to take advantage of Alyssa Bannan being out for the Knights, however will still have the likes of Round 4 performers, Britney Gutknecht (19 disposals, six tackles, one goal) and Gabby Newton (19 disposals, five marks, five tackles) to worry about, while Nell Morris-Dalton was strong forward with two goals, 15 touches and 11 tackles in a season best performance. A second-half goal blitz from the Ranges saw them jump up the ladder last round, with Serena Gibbs and Laura McClelland kicking two goals apiece, while Tess Flintoff was also dominant, picking up 23 touches and six marks.The Knights have a number of options forward who have the ability to kick goals, so that will be the big task for Eastern this week as they aim to do what Oakleigh managed in Round 2, stifling the ball, stopping it from moving forward and going in hard at ground ball opportunities. Both teams have the ability to produce high scores and quickly, so it will certainly be an interesting match to finish up the round. 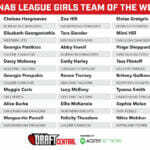 DANDENONG Stingrays and Geelong Falcons have recorded the most members in the Draft Central NAB League Girls Team of the Week for Round 3, following terrific victories. In one of the most even spreads thus far, only Bendigo Pioneers and Western Jets had one player in the team, while the other eight sides contributed two players. Stingrays’ full-back Zoe Hill makes the team for the third consecutive week, joined in this week’s side by fellow defender Brooke Vernon, and St Kilda pre-listed recruit, Isabella Shannon. For the Falcons, Paige Sheppard and Laura Gardiner slot onto the wings, while Mia Skinner‘s four goals ensure she makes the forward line. Also in attack is forward pocket regular Britney Gutknecht, who like Hill, makes her third consecutive side. Gutknecht is joined in the team by Gabby Newton who has been named in midfield. The other two players to have been named in each Team of the Week so far, are Western Jets’ captain, Elisabeth Georgostathis and Calder Cannons’ Georgie Prespakis – who this week is joined in the side by teammate Krystel Petrevski. 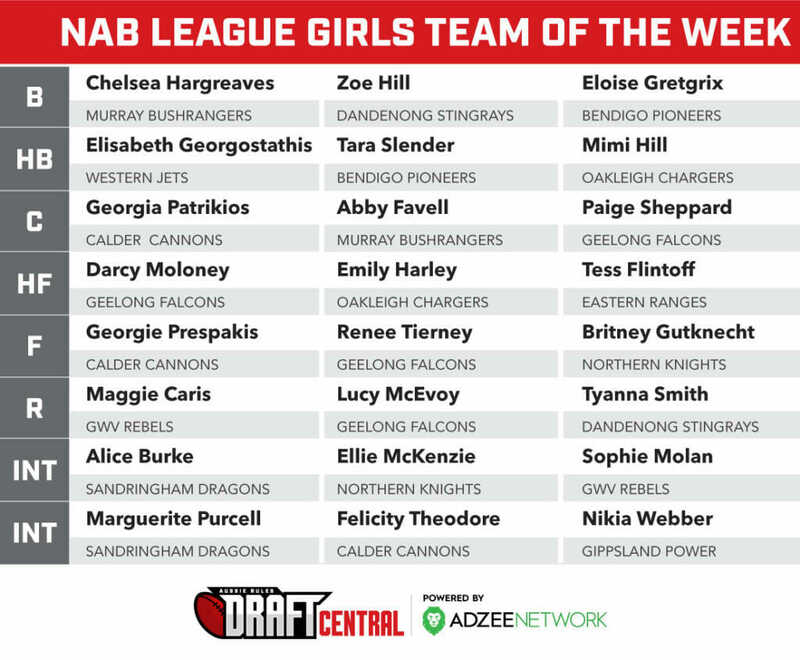 There are plenty of debutants in the Round 3 Team of the Week, with Gippsland Power defenders, Maddison Shaw and Matilda Van Berkel both making the side, as did Eastern Ranges forwards, Riley Hall and Emma Horne. 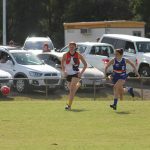 Oakleigh Chargers onballer, Charlie Rowbottom – sister of Sydney’s James – had her best game so far, named in the side with the slick Gemma Lagioia. Greater Western Victoria (GWV) Rebels ruck, Isabelle Rustman also makes her debut in Team of the Week, joined by Team of the Week regular, Sophie Molan. Olivia Barber is the presence at full forward after a couple of goals on the weekend, with the Murray Bushrangers’ bottom-ager named for the first time this year, while midfielder Abby Favell backs up her debut from Round 2. 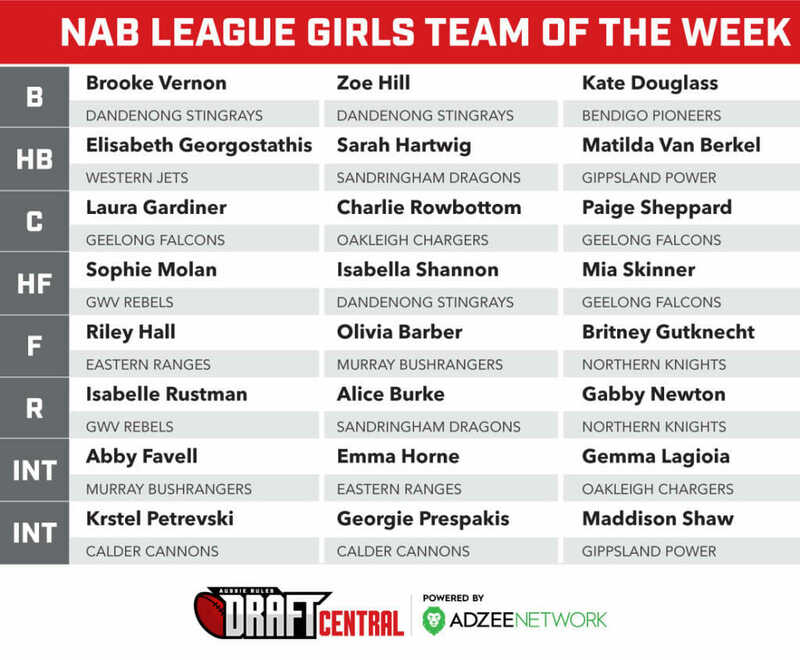 Two players who have become comfortable with the Draft Central Team of the Week are Sandringham Dragons duo, Alice Burke and Sarah Hartwig. Hartwig was named in the Team of the Week in Round 1 and is back at centre half-back again this week, while Burke was named for the second time this year for her terrific effort through midfield. 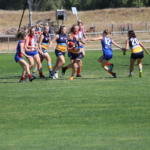 Round 3 was a tough round to pick a side, with Bendigo Pioneers’ Brooke Hards, Dandenong Stingrays’ Tyanna Smith, GWV Rebels’ Ella Wood, Western Jets’ Isabella Grant and Eastern Ranges’ Tarni Brown all in contention for a place in the team, but the strength of the midfielders this week was unbelievable. ROUND 3 of the NAB League Girls saw Geelong Falcons and Calder Cannons remain undefeated proving their dominance of the competition. While the likes of the Western Jets, Sandringham Dragons and Gippsland Power are yet to register a win this season after a tricky start. The Murray Bushrangers made it two wins in a row, with Northern Knights making their way back onto the winner’s list after a draw in Round 2. Dandenong: M. McDonald 2, L. Grocock 2, I. Shannon 2, J. Radford, T. Smith. GWV: I. Rustman, C. Leonard, S. Molan, E. Wood, G. Pidgeon, V. Jewell. Dandenong: B. Vernon, Z. Hill, T. Smith, G. Howes, I. Shannon, A. Liddle. The Dandenong Stingrays won their second game of the season against the GWV Rebels at MARS Stadium in Ballarat. The windy conditions made things difficult for both sides as they had trouble adjusting early. There was a cross breeze early in the game that slightly favoured the Wendouree end, yet the breeze became more prominent as the game went on. The Rebels could not take advantage of this early breeze and despite having more of the ball, were not able to register a goal in the first term. The Stingrays defence held up well with the key defender Zoe Hill, making things difficult for the Rebels. The Stingrays took advantage of the wind in the second quarter, and the Rebels really struggled to get any penetration on their kicks. Rebels captain, Sophie Molan, attempted to lead the way and prove to her teammates what was required when kicking into the wind, but the Stingrays were simply too good. Tyanna Smith had a great quarter, finding space around the ground, and producing an amazing highlight. Smith cleanly scooped up the ball on the wing, took a bounce and kicked the ball long into the Stingray forward line. Unfortunately for Isabella Simmons, the Stingray’s third goal for the quarter came from her running the ball out of the square the wrong way and kicking it long into the Stingrays forward line. The goal was duly converted. This was even more unfortunate, as Simmons would have been one of the leading possession winners on the ground at the time, and also one of the Rebels best. The third quarter was exciting, and the Rebels announced that they were not going to be pushed over. After Stingrays ruck Georgia Howes left early in the quarter, the Rebels were dominant at stoppages. Molan again led the way, going forward and kicking two goals in six minutes, and there was a sense at the ground, that the tide was changing. Ella Wood also started to get her hands on the footy a lot more, having an important 5 minutes when the Stringrays resistance began. It was not enough for the Rebels. Isabella Shannon kicked a goal against the run of play, but the dagger blow game when the Stingrays kicked another, after a brutal 50 metre penalty that brought them within point blank range and only 30 seconds in the quarter remaining. This meant that Stingrays increased their buffer back to 3 goals, and severely impacted the Rebels comeback. Chloe Leonard started the final quarter well for the Rebels, winning back to back clearances and attempting desperately to bring the margin back within reason. Yet the Stingrays finally put the game away after the seven minute mark of the final term, after Molly McDonald goaled with a volley from the goal square. There would be some concerns for the Rebels with Wood going off late with a shoulder injury, but the game was much closer than the score line suggested. Molan was impressed with the young Rebels’ sides fight. Stingray Isabella Shannon was the best player on the field, and an absolute moral for votes in the league count, but Molly McDonald and Tyanna Smith were also solid contributors for the Stingrays. For the home side, the captain Sophie Molan led from the front, but Ella Wood and Chloe Leonard were also terrific. Calder: G. Elarmaly, H. Cooke, N. Crowley, A. Magri. Sandringham: A. Burke, W. Laing, S. Hartwig, C. Saultry, E. McNamara, S. Trim. Calder: K. Petrevski, Z. Friswell, G. Prespakis, H. Cooke, Z. Hardiman, G. Elarmaly. Calder Cannons won their third consecutive match with a terrific last term to overrun a determined Sandringham Dragons outfit, handing the Dragons their third consecutive loss to start the 2019 season. Both teams were evenly matched throughout the game, and it took until the final term for the undefeated Cannons to finally shake off their opponents in challenging conditions at Trevor Barker Oval. Emma Stuber booted the first goal of the game for the Dragons to get them off to the perfect start, and due to weather conditions, the home side added the only score – one behind – in the second term to head into half-time with a five-point advantage. Calder dominated the third term, peppering the goals but could not find a major until Alisa Magri finally put through a goal after a great kick from Georgie Prespakis. They led by five points at the final break, but ran out the last quarter stronger, as Haylea Cooke booted the first less than two minutes into the quarter, then a couple of late ones to Gloria Elarmaly and Neve Crowley sealed the deal in a 4.8 (32) to 1.3 (9) victory. Krstel Petrevski was impressive throughout, particularly early as she collected 16 disposals, laid three tackles and had four inside 50s, while Prespakis had 23 disposals, three marks, four inside 50s, two rebounds and eight tackles, while missing a couple of chances on goal. For the Dragons, Alice Burke was enormous laying 10 tackles from 16 disposals and six marks, laying some crucials smothers as well. Sarah Hartwig was impressive in defence with 13 disposals, three marks, five tackles and six rebounds, while Winnie Laing and Eliza McNamara had 11 touches each on the inside. Northern: A. Bannan 2, T. Pulcino, M. Ramsay, B. Gutknecht. The Northern Knights stamped their authority on the competition with a 25-point victory over the Western Jets at RAMS Arena. After a relatively close start, Northern put on the after burners to push the lead out and did not look back keeping the Jets goalless in the second half. The Knights looked like a polished outfit with the likes of Gabby Newton, Ellie McKenzie and Britney Gutknecht starring in the middle and contributing to the scoreboard. The three were clean with ball in hand and worked tirelessly across the ground to win the footy in the contest. For the Western Jets, Elisabeth Georgostathis once again dominated going in hard at the stoppages and using her speed to try and break away from the packs but it was not enough to stop the Knights who were on top across the field. Ruby Tripodi was a tackling machine and got hands to plenty of ball throughout the game and combined well with Western teammate, Taylah Kolevski. Murray: O. Barber 2, L. Sharp, T. Verhoeven. Murray: O. Barber, T. Brett, A. Favell, C. Hargreaves, M. Quade, Z. Spencer. Gippsland: M. Van Berkel, M. Fitzsimon, G. McRae, C. Abrahams, M. Shaw. Murray Bushrangers made it two wins on the trot with a hard-fought victory over the winless Gippsland Power at RAMS Arena. Following a disappointing Round 1 defeat to Northern Knights, the Bushrangers have strung two impressive wins together, with the latest being a 4.12 (36) to 1.3 (9) win against the Power yesterday. Neither side could find the big sticks in the first half, with the Bushrangers holding the Power scoreless to half-time, while booting 11 behinds themselves. Olivia Barber looked impressive early, but missed a couple of close chances, before being rewarded in the second half with a couple of majors. The Bushrangers booted the last four goals of the game after Grace McRae became the first goalkicker with a major in the tenth minute. It put the Power within three points, before Barber gave the Bushrangers deserved breathing space at the final break by eight points. They managed to finally get reward for effort in the last quarter with Barber, Lily Sharp and Tali Verhoeven all slotting goals to secure the 27-point victory. Barber was the best on ground with her work inside 50, but the defensive work of Matilda Van Berkel, Megan Fitzsimon and Maddison Shaw was critical in the Power staying in the contest. Abby Favell and Grace McRae were prominent in midfield for their respective sides, while Teagan Brett put out another consistent performance as well. Chelsea Hargreaves was impressive up the Bushrangers’ defensive end, while Chandra Abrahams laid a number of strong tackles and defensive efforts. Eastern: T. Flintoff, R. Hall, L. Hilton, L. McClelland. Oakleigh: E. Harley, A. Peck, J. D”Amato. After a slow start to the game the Eastern Ranges claimed their second win of the season against the Oakleigh Chargers. The Ranges kept the Chargers scoreless in the second half of the match piling on two goals themselves. Emma Horne proved to be a key player for the Ranges while teammate Laura McClelland slotted a major. Tarni Brown was instrumental across the field while Riley Hall was solid for the Ranges who went home six point winners. Tess Flintoff was also amongst the best for Eastern chipping in with one major and getting her hands to plenty of ball throughout the game. For the Chargers, the likes of Charlie Rowbottom and Gemma Lagioia were impressive with Rowbottom racking up the touches. Emily Harley and Jasmine D’Amato combined to score two goals between them and keep the Chargers in the game. The Geelong Falcons kept their perfect NAB League record in tact with another dominant display on Sunday, accounting for Bendigo Pioneers by 49 points. With their wings unclipped atop the table, the Falcons looked sturdy across every line throughout the game and put the result beyond much doubt early on. Mia Skinner was at the centre of each Geelong attack, booting three first-half goals and ending with a bag of four to have seven in the last two games. Her forward partners, Renee Tierney and Elise Vella, were also dangerous but Skinner prevailed as the sole Falcons multiple goal kicker. 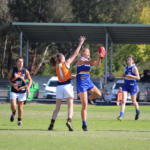 Typically stingy in defence, the Falcons kept their opponents goalless across three quarters for the second week running, but Mia Ward broke through for the Pioneers in a fighting final term to slot through her side’s only major. Skipper Lucy McEvoy was thrown back in the final term as Abbey Chapman went forward and fetched a goal, but was worn tightly all day by Bendigo’s Brooke Hards. While the Pioneers were valiant, the ladder leaders were simply too strong and flex their muscle to run out comfortable winners. ROUND 3 of the NAB League Under 18 Girls competition has arrived, and with it comes another weekend of intense footy across the board. In such a short season every win matters, so every game is on the line once again as teams settle into their lists and leaders emerge. Sandringham is in for another tough week as they take on the Calder Cannons, who are sitting in second on the ladder after two convincing wins in as many weeks. Calder will look to star bottom-ager, Georgie Prespakis again this week, after she picked up 22 disposals and kicked seven goals last week against Greater Western Victoria (GWV) Rebels. Sandringham’s Alice Burke had a solid game through the midfield in Round 2, racking up 20 disposals and 11 tackles in the Dragons’ loss to Dandenong, making her the perfect candidate to lead the charge against the Cannons’ dominant midfield. Burke was matched by fellow mid, Eliza McNamara in her disposal tally, winning plenty of contested ball and creating clearances, while Marguerite Purcell along the wing proved her effectiveness in the first half last round, before a quieter second half lowered her influence on the match. The trio will have to watch out for Cannons midfielder, Georgia Patrikios (21 disposals, seven inside 50s), who who performed well as she returned to the side last week, while Gloria Elarmaly (nine tackles, 14 disposals) and Alana Barba (six tackles, two rebounds) both showed some good signs through the midfield and will certainly make it difficult for the Dragons to penetrate the forward 50. Round 3 will see a battle for control of the middle of the ladder as both GWV Rebels and Dandenong come into this match sitting on a win and a loss apiece. Only percentage separates the sides, so it will be a big match to determine ladder positions in such a short season. Sophie Molan worked tirelessly through the middle, racking up 24 touches for her efforts extracting the ball to create clearances, while Ella Wood was impressive throughout against the Cannons. Dandenong showed the depth of their forward line last round, with five individual goalkickers making their mark on the match, while defender, Zoe Hill will be key down back to reduce the impact of the Rebels up forward. Isabella Shannon was a tackling machine through the midfield, racking up 12 tackles to go with her team high 18 disposals. Reducing the wealth of the Stingrays’ goalkicking options will be key for the Rebels’ success, while the midfield battle is sure to be one to watch. Last year’s grand finalists, Northern will come into Round 3 off the back of a draw to Oakleigh, so are sure to be raring to go against their Western counterparts, likely to pull out all the stops against the Jets, who are sitting winless in tenth. The Knights will hope for big games again from Ellie McKenzie and Alyssa Bannan, who had mirrored efforts in Round 2 with five inside 50s and kicked two goals apiece, while a shared tackling effort around the ground saw Jess Fitzgerald rack up nine, with six other Knights picking up five or more tackles each. With strengths across the field, Northern will be hard to stop once they get going, and have the ability to run over their opposition. Despite difficulty taking advantage of opportunities in the forward 50 last round against Murray, the Jets had some standout players in Elisabeth Georgostathis (28 disposals, seven rebound 50s) and Isabella Grant (19 disposals, six marks), both players who have the ability to run amok if given the opportunity. Sunday’s opening match will be a lower ladder brawl, seeing ninth placed Murray Bushrangers host bottom of the ladder, Gippsland Power. Murray had three players hit 20 disposals in Round 2, with Abby Favell the main culprit with 21 disposals and five marks. Zali Spencer and Millie Brown were also pivotal through the midfield, while Sophie Locke and Mikaela Trethowan dominated the tackles with eight apiece. Gippsland will need to outplay the Bushrangers’ midfield to ensure a second win on the trot, a role that will see players the likes of Nikia Webber and Chandra Abrahams put to the task. Webber racked up eight tackles and 15 disposals last round while Abrahams had a quieter match compared to her impressive Round 1 performance, but the pair are likely to put forward a strong performance against a relatively even midfield counterpart in the Bushrangers. The Eastern Ranges will host Oakleigh Chargers at midday in a match that will see ball magnets combine for an intense and relentless pressure filled contest. Eastern endured a loss in a low scoring affair against the Bendigo Pioneers last round while Oakleigh suffered a draw against Northern, so both sides will be raring for a hard and tough contest to get the four points. Tess Flintoff flexed her muscles last round, dominating the midfield with 23 touches, 11 marks and nine inside 50s, however didn’t have many opportunities or options forward to capitalise on her efforts. Tarni Brown paired well, laying a game-high eight tackles to go with her 17 disposals and four inside 50s. Flintoff and Brown will want to back up their strong performance against the Chargers, but the strength of Oakleigh’s composure with the footy is likely to get them over the line this week. Mimi Hill’s ability to clear the ball out from stoppages on her way to 17 disposals was key in last week’s match against Northern, while Amelia Van Oosterwijck’s ability to layer intensity and pressure on ball movers allowed her to notch up 10 tackles, topping her nine touches. Meanwhile, Emily Harley will want to keep her successful start to the season going, with seven goals over the first two rounds proving her strength in front of goal, meaning Eastern will have to ensure their defence is top notch. Geelong is back in top spot this week after a convincing Round 2 win over Eastern, settling back comfortably into where they sat for majority of season 2018. Lucy McEvoy’s fine 2018 form has continued into this season, racking up 26 disposals, six marks, six tackles and a goal, while Darcy Moloney and Paige Sheppard combined for 41 disposals and 14 inside 50s. The Falcons’ ball movers are backed up by two players who kicked a bag of goals apiece, the likes of Mia Skinner (three goals and eight tackles) and Renee Tierney (four goals, 15 disposals), while four other individual goalkickers last round just goes to show the extent of Geelong’s strength forward. A team effort across the board got the Pioneers the four points last week, with a smattering of players contributing through the midfield to create opportunities forward. Brooke Hards (17 disposals, five tackers) and key defender, Tara Slender (16 disposals, seven rebounds) combined well, with Slender currently top of the leaderboard for rebounds and likely to line-up on Geelong’s Skinner to try and reduce her impact forward. Fellow defender, Kate Douglass is likely to line up against Tierney. Bendigo will need to be at its best, but have shown some terrific competitiveness and will look to match the benchmark in the competition.